Many centuries women search the products that help them stay young and beautiful. Did you know that sea buckthorn has a long history of treating aging issues and used in health and beauty for more that twenty-eight centuries? 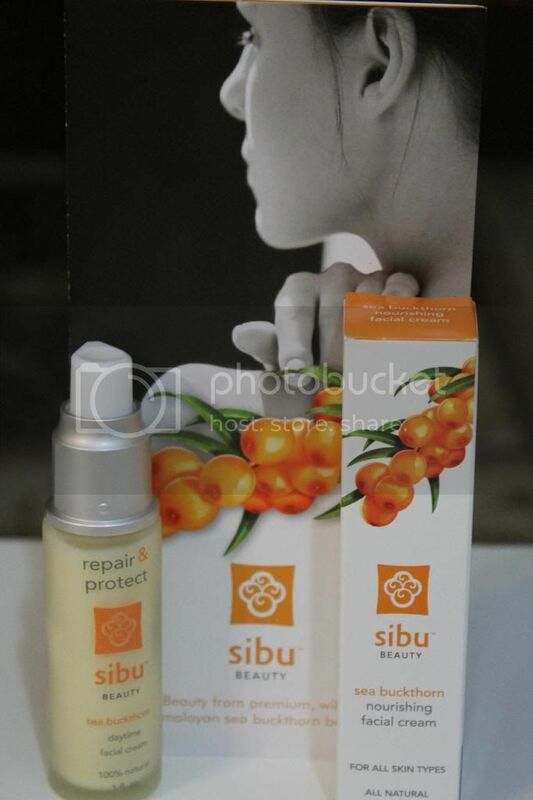 Sibu Beauty is a health and beauty company, that offers incredible line of products for skin, hair and nails using as a main component premium 100% natural Himalayan sea buckthorn berries. Sea buckthorn is rich with essential Omega fatty acids including Omega 7 which the berries have in abundance. Omega 7 is a natural component of healthy skin and helps the production of collagen diminishing with age. I received sea buckthorn nourishing daytime facial cream from Sibu Beauty, and I loved it from first try, it smells so good and I can even say so familiar. My grandmother grows sea buckthorn trees and I remember the days when we spent nice lazy afternoons outside in my grandmother’s garden feeling how sea buckthorn smell filled the air. I like that the cream is absorbed right away after applying as if my skin was so “hungry” that just “eat” the cream food. Sibu Beauty cream helps the skin to boost collagen production which diminishes with age. It also rejuvenates sun-damages skin and helps restore blemished skin to its natural condition what worked great for me since I spend lots of time outside with my little one and travel quite often. After using daytime facial cream my skin became soft, and now looks younger and refreshed. I was very glad to learn that Sibu Beauty products can be used on all skin types and they contain 100% natural ingredients. If you like to try amazing Sibu Beauty, here is a list of stores where you can find Sibu products http://www.sibubeauty.com/store_locator.php. PS. I think I need to have a visit to one of the store and get more Sibu products this month, with my upcoming mommy challenge video recordings and upcoming trip to the movies to watch the latest Disney release with my little one I feel that these are good reasons to gain a pretty look and Sibu definitely can help me with that. Sea Buckthorn is using in weight loss supplements. Check out Ultra Omega Burn review to see more.